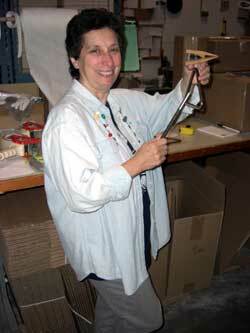 On July 2nd, LA based percussionist Judy Chilnick stopped by the factory for a visit. Judy was particularly interested in our Bronze Pro triangles. Judy told us that she owns a 6″ Bronze Pro which she not only loves, but that gets positive comments about the beautiful sonorities produced by her instrument. Judy picked out a 5″ triangle to add to her collection. She also took the opportunity to hand select some Artist’s Choice bamboo timpani mallets. Judy is a busy freelancer and respected teacher in the LA area. Thanks for stopping by Judy!